Whether you ready to buy, build, or makeover a garden shed, there are plenty of ideas here to get you started. These backyard sheds have every style: country, rustic, modern, elegant—you name it. Come grab ideas and start transforming your space. For more garden ideas (there’s lots! ), also see the Garden Idea Galleries here. These ideas come from garden sheds I have visited, readers of Empress of Dirt, and my own garden. I love seeing how gardeners take basic sheds and transform them into quirky, functional garden art. I do not have plans for any of these sheds, but you can always find plans online, in books, or buy a ready-made shed and then personalize it with paint, plants, and decor. Public libraries often have copies of books like this one: Black & Decker The Complete Guide to Design and Build a Shed. If you have a shed you would like to show off, please visit the Empress of Dirt Facebook page and share it to the page (upload it). 1. Size: What will you use the shed for? Make sure you choose a style and design with enough room to store everything without cramming it in. 2. Materials: Do you want wood, metal, a plastic composite, or some other material? If you are placing the shed near your home, it’s nice to have related designs, or common elements that tie everything together. 3. Entry: Beware of tiny shed doors! If you are storing a large lawn mower or building materials, be sure the doors are wide enough for easy entry and exit. If you have a ride-on mower, you’ll need a ramp and double doors. 4. Windows: Adding windows removes some indoor storage space but they do provide natural light. And, they make a shed look homier, rather than like a big box of wood. 5. Electricity and Water: Will you need power or water at the shed? If so, plan for these before building. If you’re hiring an electrician or plumber, they will need to put in the lines before you start building. 6. Insulation: If you might use the shed as a cabin/office/bunkie/hiding spot, consider whether it’s worth adding insulation for warmth. Or at least rough things in so you can add it later. 7. Placement: Get strategic with your placement: you probably want the shed handy for accessing tools, but also consider using it to provide extra privacy (block out the view from a neighbour’s yard). Also consider whether it will block sunlight and create shade in part of your yard. You can save on materials by building the shed against your house. 8. Floor: Will your shed have a foundation or flooring? Ready-made sheds from home improvement stores are often sit right on the ground and have dirt floors. If you want something else, you’ll need to have it ready after the electricity and plumbing are roughed in and before you build. 9. Permits: Many municipalities require building permits (and inspections) for any structure like this that will be overhead. Check local bylaws to see if you need permission or to buy a permit. Thrifty Garden Shed Makeover | Empress of Dirt friend Judy Jones shares the wonderful transformation of her backyard shed. Rustic Fall Decor Makeover | Adding garden art/junk and fall decor to my shed. Painting Vinyl Siding on a Shed | A long-awaited makeover in my garden. Add a Dutch Door to Your Garden Shed | Great way to keep garden tools handy. 27 Favourite Backyard Sheds | Snapshots from home garden tours and my own garden. 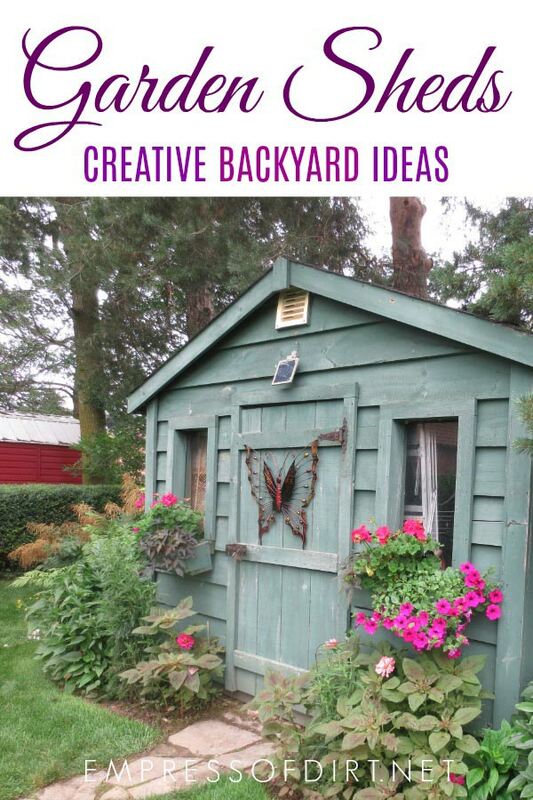 18 Fabulous Garden Shed Ideas | Practical ideas for any budget. 40 Creative Home Garden Shed Designs | Find a favourite for your garden.